Actual Mk3 vernier Iso. kit (requires modification of the pre-Mk3 front Iso. mount tube)? Or, pre-Mk3 vernier Iso. conversion kit (mount tube doesn't require machining)? However, you might want to consider fitting one of the head steady upgrades (Taylor, CnW, OldBritts, Norvil, etc.). The drop in Mk III Conversion Kit. So the Spring Head Steady will work with the OEM Head Steady Mounts...? Nice, I'll ask Bryan if he wants to go with that mod. Those other units look great. So the Spring Head Steady will work with the OEM Head Steady Mounts...? Yes, you only need to drill 2 holes in the front of the existing box head steady, they are not on the center of the steady however but offset as the engine is offset to the center line by 1/8" so you drill the 2 holes 1/8" to the right. I will encourage Bryan to go with the Spring Mod. I assume that the photo on their site omitted the coils for the sake of clarity..? To better illustrate the saddle type bracket up on the lower frame rail. I would like to see a shot of the Andover Race Style Assy. installed also. Again assuming that replaces the OEM...? Springs are in place in the final photo. I assume that the photo on their site omitted the coils for the sake of clarity..? To better illustrate the saddle type bracket up on the lower frame rail. Ignition coils? Yes, it all fits with the standard coils. 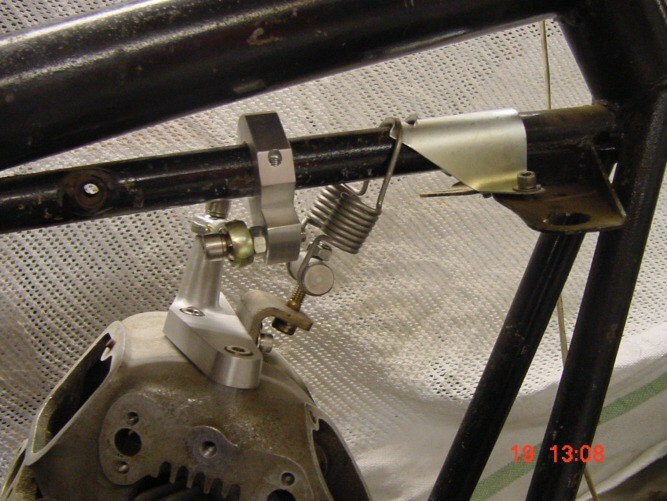 The Taylor head steady doesn't use the original threaded frame mounts. Last edited by L.A.B. ; 02/10/19 1:26 pm. That would solve the repair problem that I have currently. I like it. Still not certain how I am going to accomplish that. 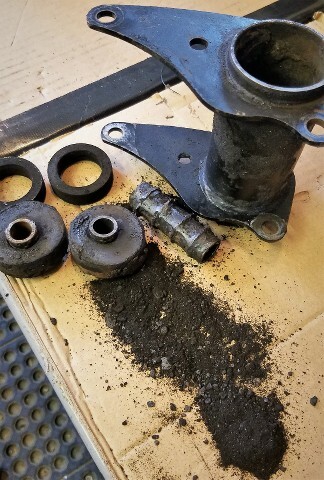 The left side is still in the frame, part of the rubber sheared off and the internal stub in the threaded boss and frozen tight. The other side has the internal threads stripped and I could Heli-Coil that side. Probably end up drill out the left side from the right side. The left side is still in the frame, part of the rubber sheared off and the internal stub in the threaded boss and frozen tight. Cut the remaining rubber off the mount to reduce smoke/stink/fumes. Been busy with some other projects... finally took that sheared rubber off and I was able to spin the remainder of the mount out with little effort. I can now Heli-Coil the right side. Here's a shot of the disassembled front Iso mount... Dust to dust. Last edited by Robert Dentico; 02/19/19 1:40 am. We have the new Rear Engine Cradle, Spindle, Bushes, Caps, O-Rings etc... A test fit of the spindle into the swingarm bushes and the cradle went great, lovely sliding fit. Excited to go back together after swingarm paint.